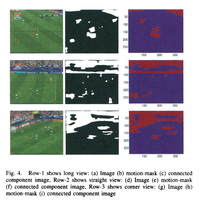 5 Publications by "M. H. Kolekar"
Abstract—In this paper, we present a novel automated indexing and semantic labeling for broadcast soccer video se- quences. The proposed method automatically extracts silent events from the video and classifies each event sequence into a concept by sequential association mining. The paper makes three new contributions in multimodal sports video indexing and summarization. First, we propose a novel hierarchical framework for soccer (football) video event sequence detection and classification. Unlike most existing video classification approaches, which focus on shot detection followed by shot-clustering for classification, the proposed scheme perform a top-down video scene classification which avoids shot clustering. This improves the classification accuracy and also maintains the temporal order of shots. Second, we compute the association for the events of each excitement clip using a priori mining algorithm. We pro- pose a novel sequential association distance to classify the association of the excitement clip into semantic concepts. For soccer video, we have considered goal scored by team-A, goal scored by team-B, goal saved by team-A, goal saved by team-B as semantic concepts. Third, the extracted excitement clips with semantic concept label helps us to summarize many hours of video to collection of soccer highlights such as goals, saves, corner kicks, etc. 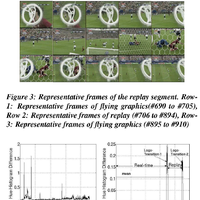 We show promising results, with correctly indexed soccer scenes, enabling structural and temporal analysis, such as video retrieval, highlight extraction, and video skimming. M. H. Kolekar, K. Palaniappan, S. Sengupta, and G. Seetharaman. 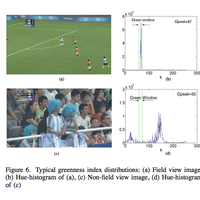 Semantic concept mining based on hierarchical event detection for soccer video indexing. J. Multimedia, volume 4, issue 5, pages 298--312, October 2009. A probabilistic Bayesian belief network (BBN) based framework is proposed for semantic analysis and summa- rization of video using event detection. Our approach is customized for soccer but can be applied to other types of sports video sequences. We extract excitement clips from soccer sports video sequences that are comprised of mul- tiple subclips corresponding to the events such as replay, field-view, goalkeeper, player, referee, spectator, players’ gathering. The events are detected and classified using a hierarchical classification scheme. The BBN based on observed events is used to assign semantic concept-labels, such as goals, saves, and card to each excitement clip. The collection of labeled excitement clips provide a video sum- mary for highlight browsing, video skimming, indexing and retrieval. The proposed scheme offers a general approach to automatic tagging large scale multimedia content with rich semantics. Our tests using soccer video shows that the pro- posed semantic identification framework is more efficient. M. H. Kolekar, K. Palaniappan, S. Sengupta, and G. Seetharaman. Event detection and semantic identification using Bayesian belief networks. IEEE Int. Conf. Computer Vision Workshops, pages 554--561, 2009. In this paper, we propose a novel hierarchical framework for soccer (football) video classification. Unlike most existing video classification approaches, which focus on shot detection followed by classification based on clustering using shot aggregation, the proposed scheme perform a top-down video scene classification which avoids shot clustering. This improves the classification accuracy and also maintains the temporal order of shots. In the hierarchy, at level-I, we use audio features, to extract potentially interesting clips from the video. At level- 2, we classify these cUps into field view and non-field view using feature of dominant grass color ratio. At level-3a, we classify field view into three kinds of views using motion-mask. At level-3b, we classify non-field view into close-up and crowd using skin color information. At level-4, we classify close-ups into the four frequently occuring classes such as player of team-A, player of team-B, goalkeeper of team-A, goalkeeper of team-B using jersey color information. We show promising results, with correcdy classified soccer scenes, enabUng structural and temporal analysis, such as highlight extraction, and video skimming. M. H. Kolekar and K. Palaniappan. 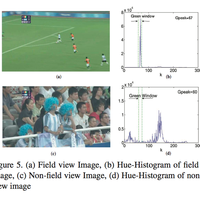 A hierarchical framework for semantic scene classification in soccer sports video. IEEE Region Ten (TENCON) Int. Conference, pages Online, 2008. In this paper, we present a novel hierarchical frame- work and effective algorithms for cricket event detection and classification. The proposed scheme performs a top- down video event detection and classification using hierar- chical tree which avoids shot detection and clustering. In the hierarchy, at level-1, we use audio features, to extract excitement clips from the cricket video. At level-2, we clas- sify excitement clips into real-time and replay segments. At level-3, we classify these segments into field view and non- field view based on dominant grass color ratio. At level- 4a, we classify field view into pitch-view, long-view, and boundary view using motion-mask. At level-4b, we classify non-field view into close-up and crowd using edge density feature. At level-5a, we classify close-ups into the three fre- quently occurring classes batsman, bowler/fielder, umpire using jersey color feature. At level-5b, we classify crowd segment into the two frequently occurring classes specta- tor and players’ gathering using color feature. We show promising results, with correctly classified cricket events, enabling structural and temporal analysis, such as high- light extraction, and video skimming. M. H. Kolekar, K. Palaniappan, and S. Sengupta. Semantic event detection and classification in cricket video sequence. IEEE Indian Conference on Computer Vision, Graphics and Image Processing, pages 382--389, 2008. A novel framework is presented for semantic labeling of video clips, automatically segmented from broadcast video of soccer (football) games, as highlights and excitement clips etc. The proposed framework provides a generalizable method for linking low-level video features with high- level semantic concepts defined in a commonly understood sports lexicon. Three important contributions are made to automatic annotation of sports video, as follows. First, domain knowledge combined with an event-lexicon and a four-level hierarchical classifier based on low-level video features is used to label video segments. Second, a priori event mining is used to establish probabilistic event-associations that are used to assign a concept-lexicon, such as goals and saves, to each highlight video segment. And, finally, the collection of highlight video clips is summarized using concept- and event- lexicons to facilitate highlight browsing, video skimming, indexing and retrieval. M. H. Kolekar, K. Palaniappan, and S. Sengupta. 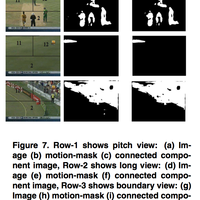 A novel framework for semantic annotation of soccer sports video sequences. Proc. 5th IEEE European Conference on Visual Media Production, pages 1-9, 2008.